Having lung cancer surgery is a life-altering event, and there is no way to minimize the emotions a person can go through after undergoing a procedure like this. It's never easy. As with any potentially life-threatening illness, the one thing that is certain is that course of a disease is never certain. And that's not necessarily a bad thing. While we tend to focus things like the average life expectancy or the average mortality, there is every chance that you, as an individual, could well exceed the averages. Having lung surgery is ultimately aimed at extending your life. Having a better grasp of what lies ahead can help you focus on what is just as important: your quality of life. Researchers today are paying attention to more than just "life years" or "adverse events" when following patients who have undergone lung cancer surgery. They want to know more about how people feel, how readily they are able to return to normal life, and how they perceive their own quality of life. One study conducted at the Seoul National University Hospital in Korea took an extensive look at the quality of life of people who had successfully undergone lung cancer surgery versus a matched set of people in the general population who didn't have cancer. What they found was that, after an average of five years, individuals treated at stage 0, stage I, stage II, and stage IIIA had no significant difference in daily functioning compared to people in the general public. Moreover, there was no difference in the survival times when comparing the types of surgery people had once they were able to achieve remission. What this tells us is that it doesn't matter so much how complicated a surgery or follow-up treatment may be; once a person is deemed cancer-free, the likelihood of living a normal quality of life is as good as someone who had undergone less extensive treatment. This is very reassuring as people who are newly diagnosed have to make decisions about surgery. In the past, some people may have opted for a lobectomy instead of a pneumonectomy (or similarly, a wedge resection instead of a lobectomy) thinking that quality of life would be better, even if survival statistics were a bit lower. Fortunately, many people are able to be active, or even climb mountains, with one lung. This is not to suggest that there aren't barriers to overcome following lung cancer surgery. According to research from the Division of Thoracic Surgery at St. James University Hospital in England, people who received multiple treatments (including surgery, chemotherapy, and radiation) had far worse breathing problems than those who had surgery alone. This doesn't mean, of course, that you can opt out of certain vital treatments, but it does suggest that extra care needs to be taken to ensure the lung function you have is retained. This would typically involve weight loss, physiotherapy, a structured fitness program, and (unsurprisingly) the avoidance of smoke and secondhand smoke. Chronic pain after lung cancer surgery, often called post-thoractomy pain syndrome or postpneumonectomy syndrome, can be a significant problem as well. Affecting up to 50 percent of people who have had lung surgery, most people respond best to a combination of treatments rather than one modality alone. Fortunately, this is a very active area of research looking not only at ways to reduce pain (such as using minimally invasive procedures such as VATS), but better ways of helping people cope with and relieve the discomfort. Following lung surgery, you would be taken to the intensive care unit (ICU) and then moved to a regular hospital room once your breathing is stabilized. 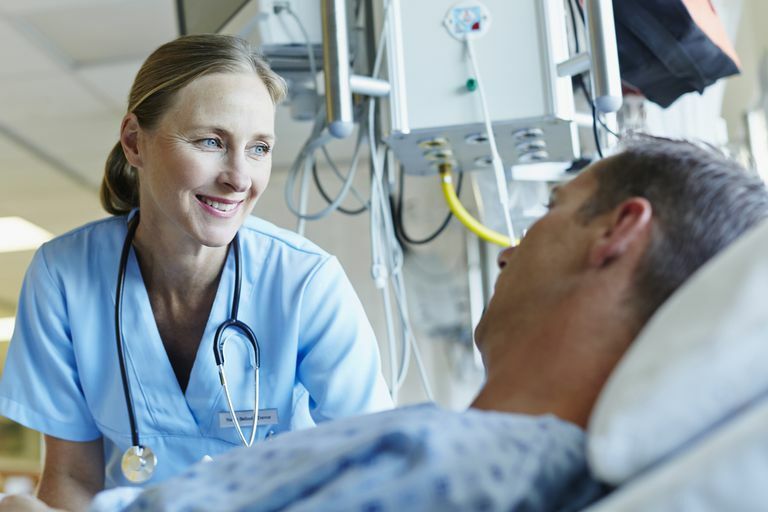 Hospital stays are usually between five and seven days but may be as long as 10 for a pneumonectomy. Once discharged from the hospital, most people will take at least two months off to recuperate. Post-surgical rehabilitation would focus on improving your aerobic function with no less than 30 minutes per day dedicated to walking. As part of your recovery, a pulmonary rehabilitation program would provide structured breathing exercises, nutritional counseling, aerobic and weight training instruction, stress reduction training, and psychotherapy to help you better cope with recovery. The program would be gradually rolled out as you improve with more strenuous activities, like weight training, delayed for at least four to six weeks following your discharge. Equally important to your recovery are regular visits with your doctor. If you are given the "all clear" and are officially in remission, you would need to have blood tests and a computed tomography (CT) scan done every six to 12 months for the first two years. In some cases, your doctor may request that you come in more frequently. If everything is still okay after two years, you would likely need to only come in once yearly for repeat blood tests and a CT scan. Bendixen, M.; Jorgensen, O.; Kronborg, C. et al. "Postoperative pain and quality of life after lobectomy via video-assisted thoracoscopic surgery or anterolateral thoracotomy for early-stage lung cancer: a randomised controlled trial." Lancet Oncology. 2016; 17(6):836-44. Pompili, C. "Quality of life after lung resection for lung cancer." Journal of Thoracic Disease. 2015; 7(Suppl 2);S138-S144. Rauma, V.; Salo, J.; Sintonen, H. et al. "Patient features predicting long-term survival and health-related quality of life after radical surgery for non-small cell lung cancer." Thoracic Cancer. 2016; 7(3):333-9. Yun, Y.; Kim, Y.; Min, Y. et al. "Health-related quality of life in disease-free survivors of surgically treated lung cancer compared with the general population." Annals of Surgery. 2012; 255(5):1000-7.